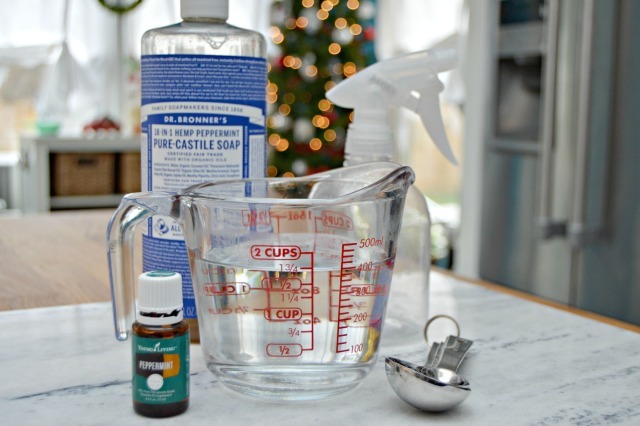 This Homemade Peppermint All-Purpose Antibacterial Cleaning Spray is a must have during cold and flu season! 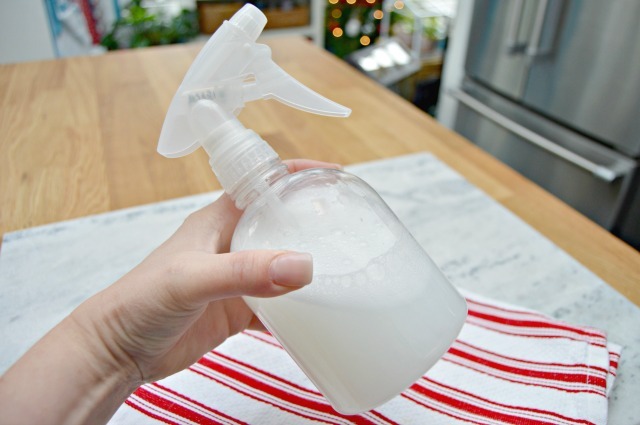 It’s easy to make and will help keep your home clean and germ free! It’s that time of the year, and I’m not talking about Christmas! It’s cold and flu season. This year, we are super busy with Cam in college and Kate’s crazy school activities, so there is no time for sickness. 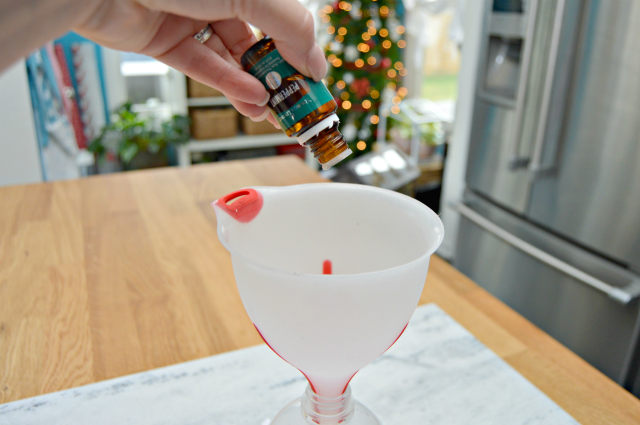 To keep as many germs and bacteria at bay, I’m using my Homemade Peppermint Antibacterial Spray on most of my home’s surfaces such as counter tops, door knobs, drawer pulls, tables…you name it, I’m spraying it with this! 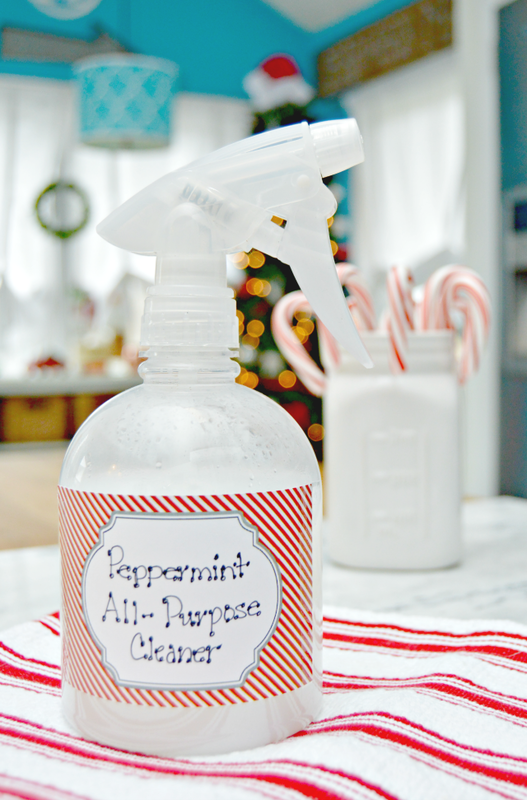 Peppermint contains natural antibacterial fighting properties, and makes this homemade cleaner smell amazing too! This post contains affiliate links, which means if you make a purchase via one of these links, I will receive a small commission. 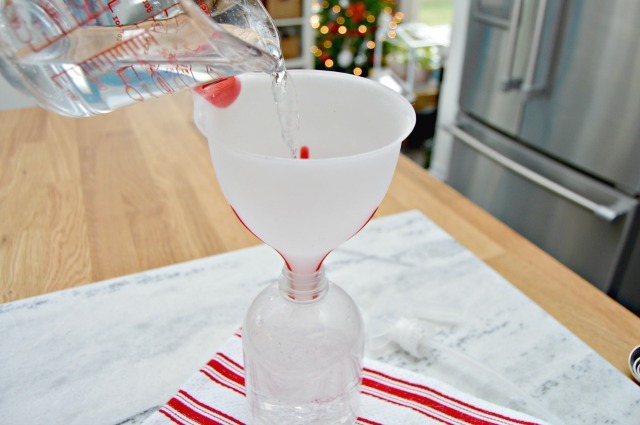 Start by adding 1 1 /2 cups of distilled water to a clean spray bottle. I use distilled water in my homemade cleaners so they will have a longer shelf life. 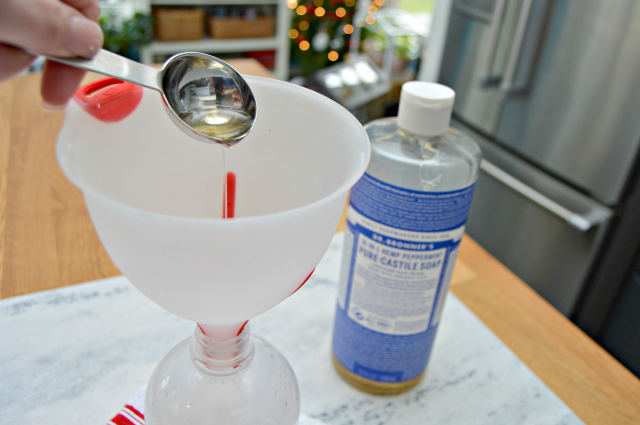 Using a funnel will help keep splatters and spills to a minimum. Next, add 1 Tablespoon of Castile soap. Castile soap is an organic, vegetable based soap and I use it in tons of my cleaning recipes. Finally, add 10-15 drops of Peppermint Essential Oil. I tend to veer more towards 15 drops because I love the peppermint smell. Shake well before each use. Because we aren’t using any chemicals in this cleaner, the ingredients may separate after sitting. 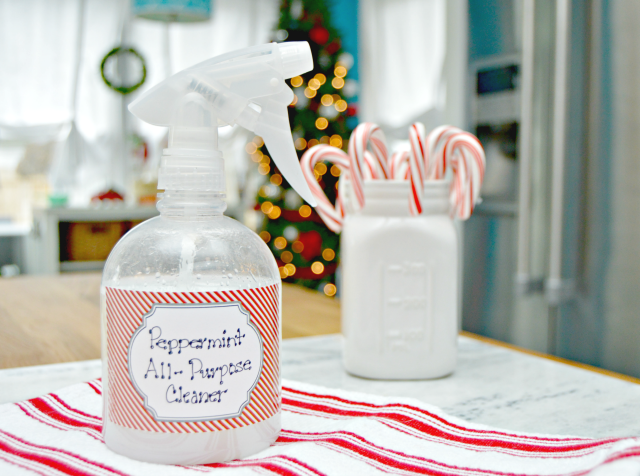 Add one of my Free Printable Candy Cane Striped Labels and use to clean just about everything in your home. I’m not sure if I would use it on granite, just because I haven’t tried that. You can find my Homemade Granite Spray HERE. As I mentioned above, the peppermint essential oil has wonderful, natural antibacterial properties. It’s also so great for congestion. When I have a stuffy nose, I just add a couple of drops of peppermint oil into my hands, rub them together, cup them over my nose and inhale a couple of times. It clears my sinuses like nobody’s business! Just don’t get it in your eyes…that’s not a great feeling at all! 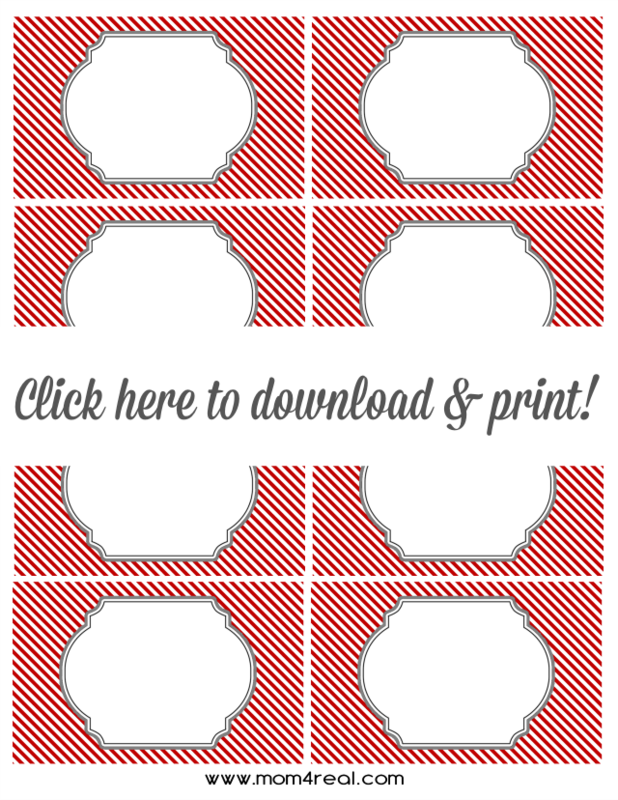 You can grab the printable labels HERE if you want to make your own. The photo above isn’t the correct size for printing. These would be especially nice to give to your family and friends or even teachers if you want to make some extras! This Peppermint Foaming Hand Soap is soooo amazing. It will leave your hands clean and smelling like candy canes! It’s made using the same ingredients as the Peppermint Cleaning Spray but works totally different in the foaming hand soap dispensers! 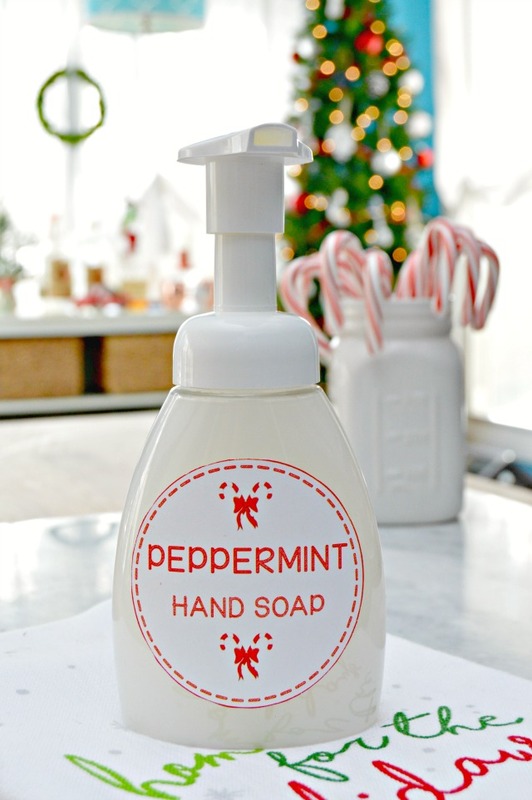 You can even print and use the Peppermint Hand Soap labels too! 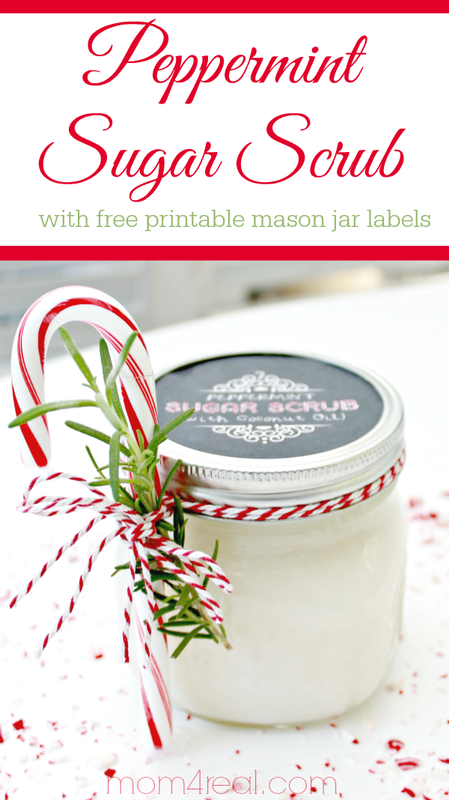 My Homemade Peppermint Sugar Scrub is one of the most popular recipes on my blog. It’s been pinned over 100,000 times and is so easy to make. It’s the perfect gift to give to anyone, any time of the year! The labels are free to print out and use too! Have some of those EOS Lip Balm containers lying around? 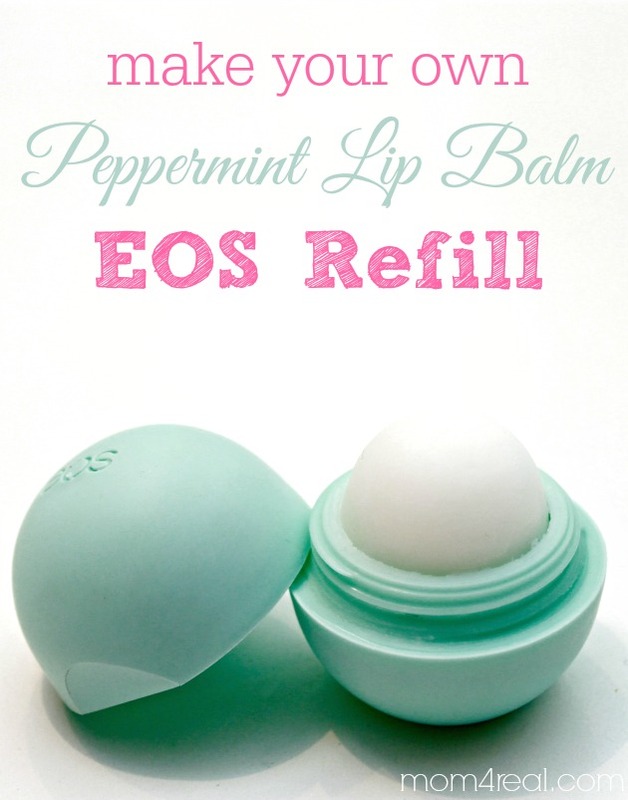 You can easily Make Your own Peppermint EOS Refills! Seriously, they are soooo easy to make! 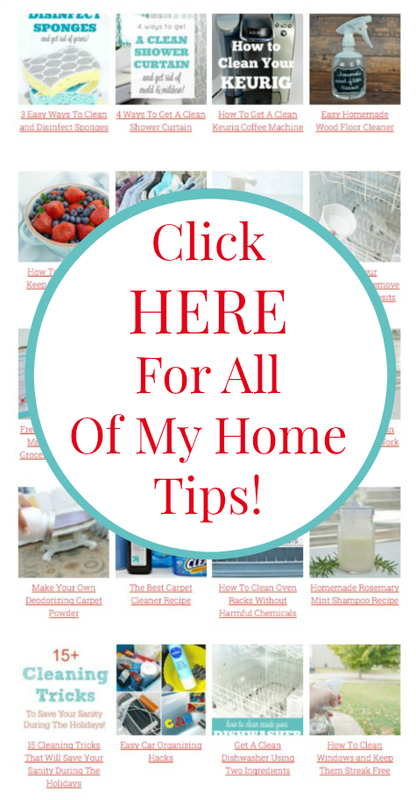 Find all of my Cleaning Hacks and Home Tips HERE on my Home Tips Page! I love the smell of anything peppermint, so I know I want to make these. Thanks! Can you use the cleaner on baseboards? You can, but my favorite thing to use for baseboards is a simple mixture of a few drops of dish liquid and warm water. Hope this helps! Thanks for the recipe. I am ordering materials to make the peppermint cleaner for my hardwoods. Does it have to be rinsed off because of the Castile soap?